Internship at IISc Bangalore (through IAS SRFP )Suresh Gurjar, NIT Rourkela, 4th year, M.Tech Dual Degree Program . Meet Suresh Gurjar – A final year undergraduate student, pursuing M.Tech dual degree program in Electrical Engineering from NIT Rourkela. With native place being Jodhpur, Rajasthan he did his schooling at Kolkata and intermediate at Hyderabad. Maintaining a good academic profile with CGPA of 9.1 he also pursues listening music, reading novels and swimming as his hobbies. Not only this, he is also involved in many club activities like taking classes for juniors.He was selected for Summer Research Programme 2013 offered jointly by three academies (Indian Academy of Science, Bangalore). Selected candidates get chance to work with experienced scientists and professors at IISC, IIT and CSIR labs. Duration of internship is 8 weeks Students carry out project work under the supervision of allotted guide and submit final report to the Indian Academy of Science at the end of 8 weeks. Selected candidates get stipend of Rs 7000/per month and travel allowances both ways in 2nd class sleeper. Time to know more about him!! InternFeel: How you came to know about the internship? Generally what was your way of being in touch with the media to get the information about the various internships? Suresh: As you know in today’s world the best source of information is Internet. I came to about this programme through internet. I was always in touch with important sites which give information about internship offers like Internshala. I advise all students who in search of internship, be in touch with sites like Internfeel, Internshala etc. IF: How much competitive is the selection process? What things you feel are looked for in the applicant by the selectors? Suresh: Since it is research programme sponsored by prestigious academies of India, competition is bound to be tough. Not only student, teachers also compete for this programme.In my opinion the selectors mainly focus on few factors like academic background, projects done, past vocational training. Recommendation letter, cover letter, abstract etc. also plays an important role in selection procedure. Selection of professor from given list is very important as we are allowed to give only 6 choices. Wrong choice (irrelevant with your area of interest) may lead to rejection of the application. IF: What qualities of yours – educational or otherwise, you feel helped you in having an edge over the selection process? Suresh: My academic background was good (decent CGPA – 9.1). I have undergone few vocational training in past. In my 2nd year, I did project under my professor at NIT Rourkela on Photovoltaic Cells, which helped me to learn a lot of things. All these factors helped me to fetch this internship. I was allotted a Guide from Electrical Department at Indian Institute of Science (IISc) Bangalore. IF: Approximately when you got the news for the selection? How was the celebration? Suresh: Generally application are invited in Sep to Nov and resulted are declared in March month. I was excited to find my name among those selected for this internship. I was happy to get a chance to visit IIsc Bangalore. IF: What all preparations you did before joining and after the results? Suresh: I hardly did any preparation before joining. I just contacted my guide and enquired about the project to be carried out at IIsc. Generally project get decided when you personally meet your guide. IF: Any problems that you faced before joining, which you feel could have been easily avoided if known in before? Suresh: No, I didn’t face any such problems. Moreover students selected for institutes at Bangalore had no problem related to accommodation as we were accommodated at IAS Guest house (well-furnished and maintained). IF: Any common mistakes which you feel students should avoid while searching and applying for internships? Suresh: As I said earlier, choices of Guides should be in according to your area of interest and field. Moreover statement of interest should be very specific. Keep in mind that CGPA is not only the criteria for selection. IF: So Suresh, could you please highlight us with what work/research project you carried out during the internship period? It’s application in near future and your work in it? Suresh: My areas of interest are embedded systems and Digital signal processing field so I chose project related to these field. I did project on Audio processing: Raaga Identification System. Basically its aim was to identify the underlying Raaga in a given audio file. The main motive behind Raaga identification is that it can be used as a good basis for music information retrieval of Carnatic music songs or film songs based on Carnatic music. IF: What was the best thing about the work culture and the internship? What all things you liked there? The difference you found in comparison with the work culture of our country? Suresh: What I found in IISc is that it has a good research motivating environment. Many students, professors are involved in research work which really inspired me. This internship programme is also made to get to know about research work going in top institutes. IISc has good facility for research work and labs are full-fledged with equipments. IF: What problems you or your friends faced, during the internship, which your juniors may be able to avoid? Food and accommodation? Suresh: Accommodation at Academy Guest House was very good but food was not that good but it was adjustable. IF: As with almost everything, what were the cons of the internship? The elements which you felt, if wasn’t there could have made this internship super awesome? Suresh: Over all the internship was good. But daily up and down from Guest House to IISc was too hectic. Timing of transportation arranged was fixed. If accommodation would have been in IISc Campus, it would have been perfect. I had no industrial tours and visits. IF: It would help the readers and other aspirants if you could bring a comparison among your previous experience in training or internships. Suresh:Other internships were vocational training (Training at Orissa Power Transmission and Corporation Limited and BSNL), where I had some practical field training. But this was a research project. In research project work, students have an opportunity to study an area of interest in depth. Overall it was different experience. IF: What was the guidance provided by your guide? What all support you received from your intern institute administration. Suresh:My Guide was very supportive and friendly with me. She helped me at every step where I faced problem. I learned a lot of things from her. I had no knowledge of music but she took few classes on music which helped to carry on the project. Any lab equipments required during project were sanctioned by IISc administration. IF: Any special experience which you had during this period, which you would like to share with us. 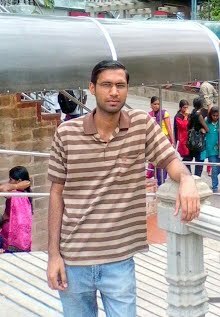 Suresh:What I enjoyed during internship at IISC Bangalore was the climate at Bangalore during summer. It wasreally cool during May-July. Campus of IISc is awesome, full of trees, greenery. In Bangalore there are many places to visits. Visit to Mysore with friends was enjoyable and memorable. IF: To whom all people you would, like to thank in context of this internship? Suresh: I would like to thank my faculty of Electrical department, who helped me in applying for this internship programme. I would like to express my deep and sincere gratitude to my guide at IISc. Her patient guidance, encouragement to new ideas and advice has made the project possible. I thank Indian Academy of Science for providing me this great opportunity. I am grateful to all my friends Abhinav, Nitin, Jay, Ayush, Gopi, Harish, Kamesh who made my stay at IISc, an enjoyable experience. I thank my parents for being a source of constant inspiration and motivation. IF: What advice you would like to give to your juniors, which can help them in getting internships in their future college life? Suresh: If you are interested in doing some research project work then this programme is best as you get an opportunity to work under the guidance of experienced and highly qualified professors and scientists at top research institutes. As I have mentioned earlier that while applying for your statement of purpose you should be very specific and area of interest should match with chosen guide. Suresh: I am interested in doing R&D job. This internship helped a lot to develop interest towards research work. IF: Any views about this initiative of InternFeel, and how beneficial it would be? Suresh: This is really good step taken by Internfeel team. Details about internships along with interview will help students to decide which internship is better for him. Tips given in interview will help students to take appropriate steps while applying for respective internships. IF: So Suresh, we are at the end of the interview. From the entire team of InternFeel, we thank you for taking out your time and sharing your experiences for everyone and we wish you best of luck for all your future endeavors. Suresh: I am grateful to Internfeel team for giving me this opportunity. Thanks for your time and consideration!! !